Follow the leafy street of New Farm and you’ll wind up at the entrance to one of Brisbane’s best-kept secrets, Vine Restaurant and Bar. Take one step inside the warm interior and you’ll feel right at home, with mood lighting perfect for that first date (are you profusely blushing and/or sweating? They’ll never know), and a wine cellar that’ll make any oenophile green with envy. Indulge in Vine’s mouth-watering range of dishes made with fresh and local ingredients, including homemade tagliatelle with a sea of scallops, bay bug, crab or other handmade pastas. Want the veal deal? Try their veal escallops with preserved lemon and potato mash – or for something heavier, their wagyu beef cheeks are a go-to. 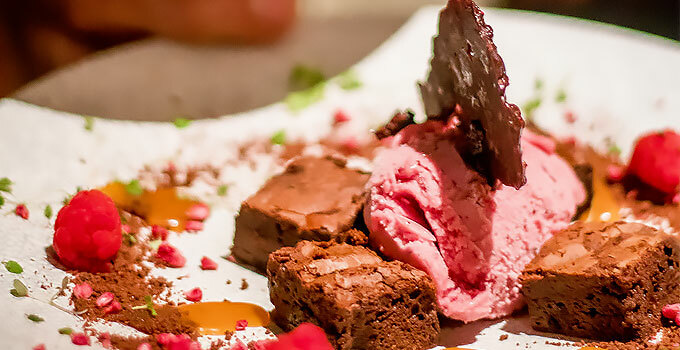 We can’t look past their desserts though – think red velvet brownies with salted caramel and cranberry sorbet, or our personal fave, lavender crème brûlée with crystallised violets and lemon curd. With an incredible selection of eats and Italian wines and beers, we’ll be creeping back for sure.